REGISTRATION: Contestants must register in person at Fircrest GC on Monday July 29th, from 12:00pm – 6:00pm or Tuesday July 30th, from 12:00am – 3:45pm. Any player arriving late MUST notify the WJGA State Office via e-mail at tyler.johnsen@wjga.net (if before July 28th). After July 28th, please contact Executive Director, Tyler Johnsen, by either email or cell phone (206) 890-0197. Place may be forfeited by a player from whom no word has been received by 3:45 P.M. on Tuesday, July 30th. Boys – alternates from each district will be used through Saturday July 27th. Girls – alternates for the girls will be assigned by Executive Director, Tyler Johnsen, from a statewide pool through Saturday, July 27th. BEGINNING July 28th – alternates for both boys and girls will be called from the Host District (3). After the close of registration, (3:45pm on Tuesday July 30th) alternates from the host district (3) will be called at their home phone number between 4:00 and 6:00 pm one time only and will be asked to stand by at the course Tuesday morning to take the place of the unregistered player if he/she does not appear. Buffet: The Players Buffet will start at 5:30pm Tuesday July 30th and closes until 8:00pm. Players are complimentary and parents and guests are welcome to purchase the buffet dinner for $TBA. Checks or cash is fine at Fircrest GC or credit card if you’re paying when you register for State online. 18-holes of stroke play for all players on Wed, July 31st and Thurs, Aug. 1st and then Fri, Aug. 2nd for all players that make the cut. The 16-18 Boys and the 14-15 Girls will play Oakbrook on Wednesday and Fircrest on Thursday. The 14-15 Boys and the 16-18 Girls will play Fircrest on Wednesday and Oakbrook on Thursday. Boys and Girls 8-11 and 12-13 divisions will play both Wednesday and Thursday at Allenmore GC. On Friday, the 8-11 and 12-13 division players that make the cut will play the final round at Fircrest GC. Ties for first place in all divisions decided by sudden death playoff; all other ties will be honored (e.g. a two-way tie for 2nd: payoff would be two second place trophies and no third) In the combined 14-15 and 16-18 divisions individual trophies will be awarded to the low four boys from one district and to the low three girls from one district. The overall State Champions may come from either the 14-15 or the 16-18 divisions. Proper golf etiquette is expected. Galleries will be permitted. Players are held responsible for the action of their families, relatives or friends. Galleries must keep their distance from players on the course and until players leave the attesting area. (25 yards-walk in rough) No Coaching Allowed. Abuse (including abuse of cell phone restrictions), harassment or interference with volunteers or officials will not be tolerated. Talking on cell phones or other similar devices or use of noise making electronic devices is prohibited. Spectator carts will not be allowed. Only official carts authorized by the Committee will be allowed on the course. No alcoholic beverages allowed outside the restaurant areas. We are a non-smoking event, please do not smoke. All spectators, family members and others, must observe the dress code of the course being played. Fircrest is a private course, and so please observe the WJGA dress code policy. Thank you! 2. Second offense — person asked to leave the course and may be refused future gallery privileges. If person refuses to leave, the player may be DISQUALIFIED from the tournament being played or suspended indefinitely from future WJGA events. 3. DISQUALIFICATION can preempt warning if the violation is flagrant. LONG PUTT AND LONG DRIVE CONTESTS are a casual atmosphere, however adherence to the Fircrest GC Dress Code is still required: Open to all contestants who wish to compete. The Long Putt portion of this event will be held at Fircrest on Monday and Tuesday July 29/30th during the same hours as registration (12 – 6 Monday and 12 – 3:45 Tuesday). The Drive portion of the event will be held on Tuesday July 30th from 4:00 to 8:00pm at Fircrest with competition by division as follows: 8-11 boys and girls 4:00 to 4:45; 12-13 boys and girls 4:45 to 5:30; 14-15 boys and girls 6:00 to 7:00; 16-18 boys and girls 7:00 to 8:00. ATTENTION – SIGN-UP FOR EACH DIVISION at Registration – no exceptions. Awards will be presented at the completion of each age division’s drive competition. A complimentary buffet dinner is available for all players; 5:30 – 8:00pm at Fircrest GC. Parents and guests are welcome to purchase the buffet dinner for $TBA – credit cards if paying online with state entry fee or cash or check at registration! WJGA DRESS CODE FOR BOTH PLAYERS AND GALLERY WILL BE STRICTLY ENFORCED AT THE LONG DRIVE CONTEST. 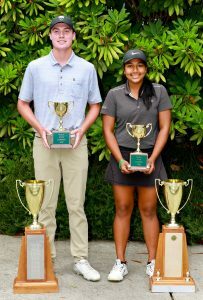 Clayton Thatcher and Adithi Anand winners in 2018! 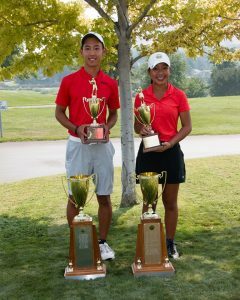 Sean Kato of Redmond fired a final round of 4-under par 68 to win the overall boys title at the 41st Annual WJGA State Championship held at Meadow Springs Country Club in Richland, Wash. His three day total of 11-under par 205 gave him a two-shot victory over Alvin Kwak of Mukilteo. On the girls side, Lauryn Nguyen of Seattle defeated Therese Warner of Kennewick with a birdie on the 1st playoff hole to capture the overall girls title at 3-under par 213. Nguyen overcame at 7-shot deficit coming into the final round and used a steady even par 72 to mount her comeback. In all 258 boys and girls competed over three days to determine boys and girls state champions in age divisions of 8-11, 12-13, 14-15 and 16-18. The field is cut to roughly 85 total players after two rounds.